The GRACE Foundation is grateful to have the incredible support of many Business Partners who are helping us with fundraiser events and donations in our communities! Thank you to the Grand Island Community Foundation for this gift of $5,000 to GRACE Cancer Foundation in December, 2018 from the Mayoral Community Impact Fund!! Hornady® Manufacturing donated a generous gift of $42,460 to GRACE during their annual Christmas party. 2018 is the 6th year The GRACE Foundation has received this gift. The donation was made possible from partial proceeds of the sale of Hornady® Critical Defense® Lite™ ammunition sold from November 2017 through November 2018. Critical Defense® Lite™ features a pink bullet tip and pink ribbon packaging to help showcase support in the fight against cancer. Thank you, Grand Island Fraternal Order of Police #24 Members for donating $655 from their pink patch sales in October, 2018! 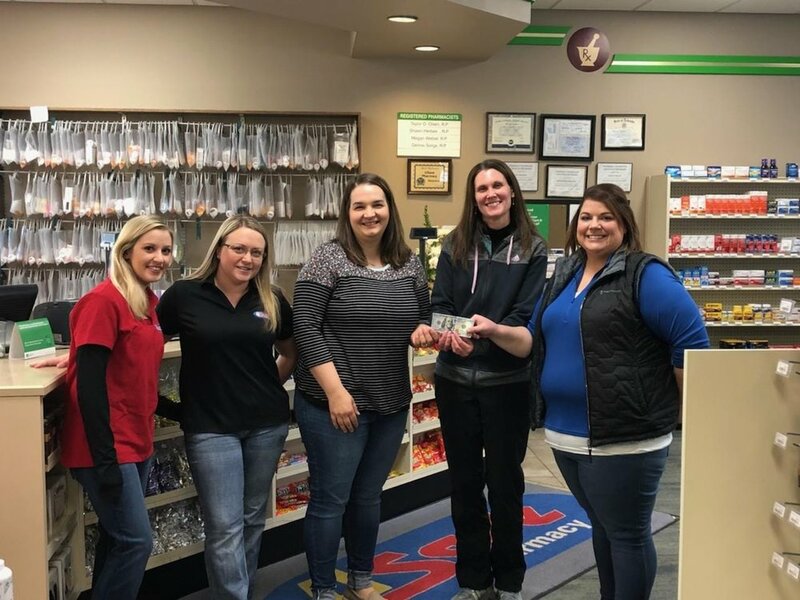 Thank you to the wonderful Grand Island U-Save South Locust Pharmacy team for donating their October 2018 jean fund to the GRACE Cancer Foundation! We are so very thankful for all the community support! Thank you to ALL the Grand Island Jazzercise crew for their generosity in supporting the GRACE Cancer Foundation with a very generous donation of $850 collected to raise awareness for breast cancer during the month of October, 2018. 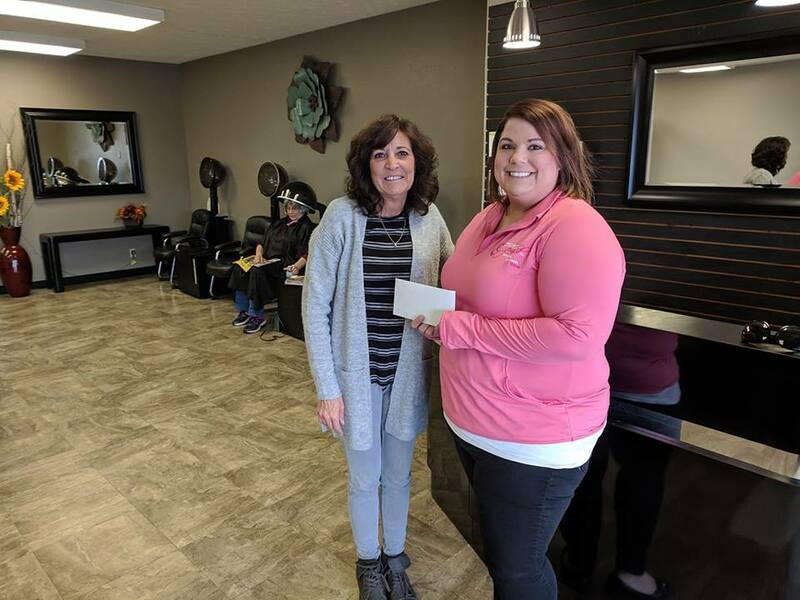 Thank you to the amazing staff and customers at ArtistiCuts in Grand Island for their donation of $320 to GRACE to help raise awareness of Breast Cancer during the month of October, 2018! Hurts Donut of Lincoln helped GRACE raised $525 in a 40-minute donut sellout September 12, 2018! Thank you, Crop for a Cure! Crop for a Cure scrapbookers raised $3816.26 at their 12th annual event for GRACE in July 2018! Thank you, Pump & Pantry and Danger Football! $5,000 in 2018 contributed from paper butterflies sold in Pump & Pantry stores plus a ticket fundraiser through Danger Football, rounded up by the Bosselman Family! Hornady® Manufacturing has donated a generous gift of $35,622 to The GRACE Foundation during their annual Christmas party. This is the 5th year The GRACE Foundation has received this gift. The donation was made possible from partial proceeds of the sale of Hornady® Critical Defense® Lite™ ammunition sold from November 2016 through November 2017. Critical Defense® Lite™ features a pink bullet tip and pink ribbon packaging to help showcase support in the fight against cancer. 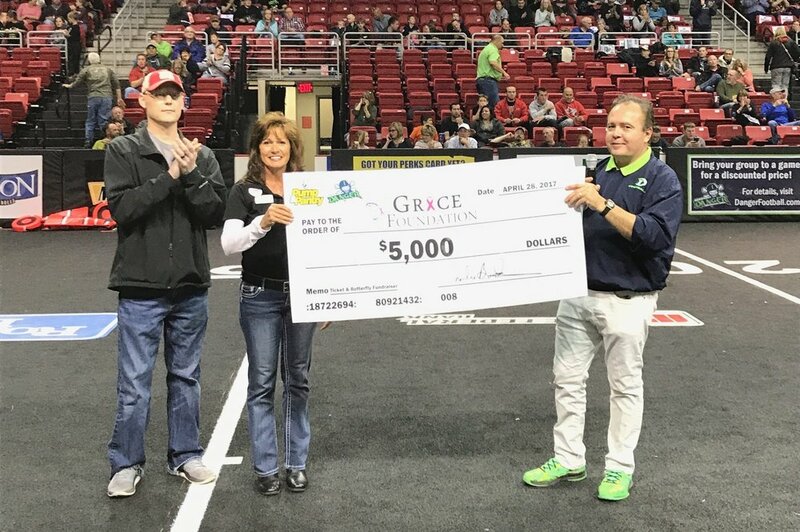 Grand Island Jazzercise raised $750 for the GRACE Foundation during October 2017 from their members! Kinkaider Brewing of Grand Island donated $.50 from every beer sold during “Kinkaider for a Cause” in October 2017 back to GRACE for a total of $1,984.53! Thank you, Grand Island Firefighters! 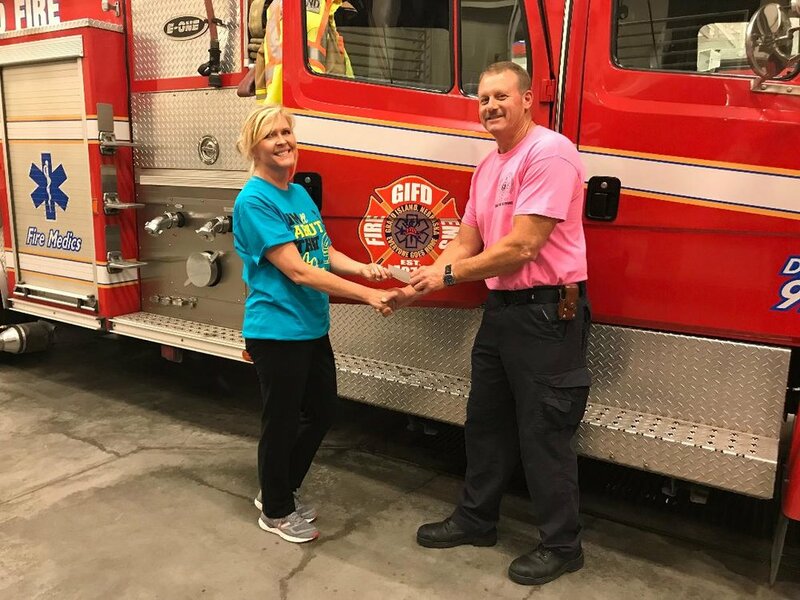 The Grand Island Fire Department sold GRACE t-shirts and raised $2,500! $5,000 in 2017 contributed from paper butterflies sold in Pump & Pantry stores plus a ticket fundraiser through Danger Football. Hornady® Manufacturing donated a generous gift of $75,571 to GRACE during their annual Christmas party. This is the 4th year GRACE has received this gift. The donation was made possible from partial proceeds of the sale of Hornady® Critical Defense® Lite™ ammunition sold from November 2015 through November 2016. Critical Defense® Lite™ features a pink bullet tip and pink ribbon packaging to help showcase support in the fight against cancer. Hornady® Manufacturing donated a generous gift of $77,026 to GRACE during their annual Christmas party. 2015 is the 3rd year GRACE has received this gift. The donation was made possible from partial proceeds of the sale of Hornady® Critical Defense® Lite™ ammunition sold from November 2014 through November 2015. Critical Defense® Lite™ features a pink bullet tip and pink ribbon packaging to help showcase support in the fight against cancer. Become a friend of GRACE! If you would like to partner with GRACE on a fundraiser, please fill out the form below and one of our staff will get back to you!